The first one was interesting seeing old big names on screen. The second one had the Chuck Norris jokes and van Damme doing his signature kicks. This one?... This one has a lot of "kaboom and badawoom"... Which is why, I guess, it is an all right movie. Mel Gibson is great, but he's got a tiny part. The only fun is provided by Antonio Banderas. As for the new actors... who cares! 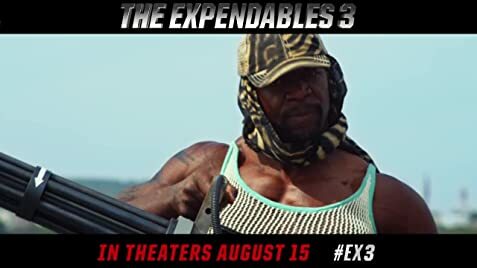 The problem with the Expendables movies is that the more big names are on the credits their on screen time has to be shared with others and it breaks down to just a few moments each. I do not understand how they missed the point again! Lucas Till was considered for the role of Smilee. Barney Ross: Lucky ring on! Lee Christmas: Feel so much safer. In the battle at the port of Mogadishu you can see Ceaser and Gunner watching what is happening from a boat. At that point Ceaser has a belt of bullets for the minigun over his left shoulder. When he says "Time to mow the lawn." the belt is not on his shoulder any more but it is connected to the minigun when he picks it up. As he fires the minigun the belt of bullets is back on his left shoulder but it is not moving even though he is firing the weapon. When he finishes firing the weapon the belt is not on his left shoulder any more. There are no opening credits, except for the title after the prologue. At a press conference, Stallone claimed that 80 frames were cut to secure a PG-13 rating in the USA. This footage, along with some strong language and other non-contentious material, was restored for the unrated Blu-ray version.